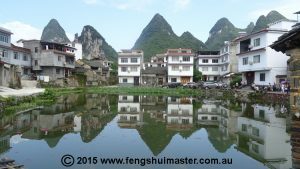 Continuing on our ‘Journey to the West’ Feng Shui Tour of China 2017 we boarded a fast train to Guilin from Guangzhou where we travelled to see the awesome, spectacular mountains of the Li River. We arrived late and stayed overnight in town so we could catch the Li River Cruise early the next morning. 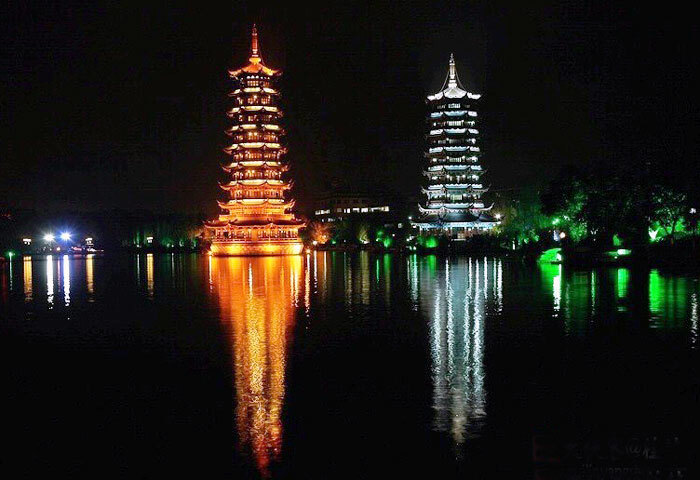 Guilin is a charming town but still somewhat backward in terms of accommodation and foreign tourism. That makes it all the more charming in many ways. Studying the Form School is one of the aims of our tour and when we are in China, the imagery and comprehension is that much more vivid. For instance, on the Li River there are dozens of stories about the mountains, created by local people, in order to make some sense of their environment (such as ‘boy worshipping the buddha,’ or ‘turtle mountain’ or ‘woman mournfully looking for her husband’ etc. etc.). In reality this has nothing directly to do with the application of Feng Shui, and to the Feng Shui student it can appear baffling, “Oh why can’t I see that dog or cow or horse mountain?” Or any other such thing, which can be quite demoralising. Of course the Feng Shui masters say, “Giving the mountain a name makes it more auspicious,” Which is what we were told recently on tour in Langzhong. Giving names to the mountains is to play with our imagination. Some masters use this as a ‘power play’ to see who knows more about the Form School than others. This idea of ‘hexiang,’ ‘calling out the image’ is an amusing game but is it based on reality? eg China is shaped like a chicken, so does that mean the people behave like a chicken? It is after all, purely imagery and its effect on the mind, which is psychology; but can we say it’s not valid? No, not at all. After all we are talking about people and how we interact with our environment, and anything to do with people is naturally about psychology too. So back to the idea of ‘hexiang’. In reference to mountains, hexiang is a way to turn an ugly or ‘dangerous’ place into something beautiful in the mind of the beholder. 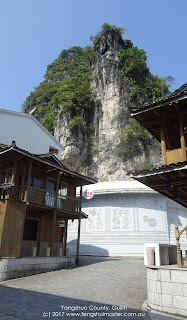 Other sheer rock faces carved out of the karste mountains in the magnificent Guilin scenery include ‘Brocade Hill’ (a rich fabric woven with a raised pattern), ‘Lotus Peak’ and ‘lady admiring a painting’. Others, like ‘Wangfu Rock – lady mournfully waiting for her husband to return’ tell tales of tragedy; every mountain along the Li River cruise has a story to tell. Close to Crown Cave, a rock descends into the river, cutting off the path between Crown Cave Village and Taoyuan Village on the same side of the river. Villagers take a ferry to reach the other village. The inhabitants of the two villages tell a tragicially romantic story of a brave boy and a graceful girl who were in love. One lived in Crown Cave Village and the other lived in Taoyuan Village. Somehow crimes were rampant and two monsters living in a cave would grab brides when their escorting teams passed by. These monsters turned out to be a green dragon and a white tiger. When the young couple married, they stole the girl by force. The brave boy killed the green dragon, but he returned to find his bride killed by the white tiger. He was so angry he took an axe to the tiger, but it escaped and he cut the path by the bank instead. Ever since, people had to take a ferryboat because the path was gone. In this story, the key here is ‘crimes were rampant.’ Under the influence of this ‘sha qi’ in the form of sheer rocks blocking the path, and exposed rocks on the mountain, society was in disarray. Perhaps the locals, or the Feng Shui masters in the distant past, gave Crown Cave and other peaks beautiful and auspicious names in an effort to change the perception in the minds of local inhabitants, turning what could be perceived as a dangerous place filled with ghosts and demons into a beautiful landscape filled with lovely maidens, pieces of artwork and boddhisatvas. Drawing on the positive effects of human psychology, now that they have a beautiful name for their mountains, the villagers can feel more peaceful. From a Feng Shui perspective, mountains with sheer exposed rocks are full of sha qi (negative energy) because we don’t like exposed rocks in Feng Shui. A very practical reason for this is that the exposed rocks are not held in place by vegetation making these areas dangerous places where landslides can easily occur, or rocks can tumble down into the valleys, destroying everything in their path. So how do these rough and rugged rocky mountains affect the people? Therefore rough and rugged mountains can influence people to become more rough and tough too. Or, if not, they can affect people in a physical way. 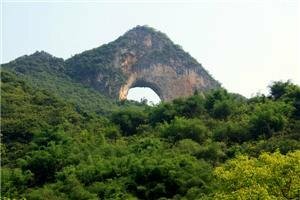 Here is a small hill in Yangshuo County, Guilin. People sleeping (in particular) opposite this mountain can become predisposed to illness of the belly (earth is ‘belly’, and exposed rocks are harmful to the belly region of the body in particular). To know for sure which area of the body can be affected, the Feng Shui of the site should be calculated to see what type of qi there is and what part of the body it can affect. In Feng Shui the best type of mountain is well vegetated, this is considered a beautiful mountain. 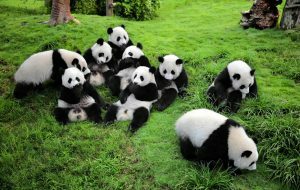 There are certainly plenty of those in Guilin too, which is why the region is considered one of the most scenic and spectacular tourist attractions in China. We as humans, love drama, and the dramatic landscape appeals to our senses. “What I liked most was a possibility to learn on tour when we can observe and discuss what we see in the consultations give us very practical tips how to use our experience. Your passion and knowledge, Jodi. What I liked least was walking with the luggage after long travel.